Alberta’s revenue problem is well documented, as is the province’s dependence on resource revenue to pay for current public expenditures. The reaction to the dramatic decline in these revenues with the fall of the price of oil in late 2014 has been considerable. Recently there has been much discussion of provincial government expenditures, with some suggesting that Alberta is spending “too much,” and more than any of the other provinces in Canada. But does Alberta really have a spending problem? Is public sector spending in the province really outpacing the level of public expenditures in other provinces? This fact sheet has been produced to bring facts to this discussion. 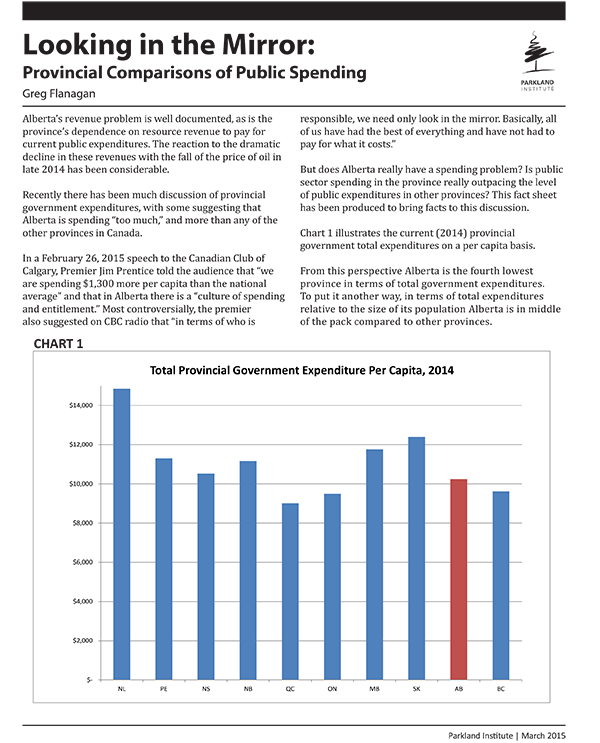 Chart 1 illustrates the current (2014) provincial government total expenditures on a per capita basis. From this perspective Alberta is the fourth lowest province in terms of total government expenditures. To put it another way, in terms of total expenditures relative to the size of its population Alberta is in middle of the pack compared to other provinces. However, Alberta has had a booming economy for much of the last few decades, putting greater pressure on costs and consumer prices. Table 1 shows provincial inflation rates based on the consumer price index (CPI) over the last 12 years. As this index is reset periodically the data is based on 2002 (CPI = 100). It is important to see here that Alberta’s inflation is seven percentage points higher than the national average. This means that it costs more for the same public service in Alberta, all other things constant, than in any other jurisdiction in Canada. Also, not factored in these figures is that Alberta`s population has been growing at a phenomenal rate, and greater than all other provinces, which also necessitates much greater infrastructure costs. In order to really compare public sector spending between provinces, it is necessary to control for inter-provincial differences in the costs of public services caused by differences in provincial inflation rates. Chart 2 shows the public expenditures of 2014 for each province normalized for these differing inflation rates. This places Alberta’s public spending as only slightly higher than just two provinces, Ontario and Québec. Because of their large populations, these provinces may enjoy greater economies of scale in the provision of public services reflected in total government expenditure. Perhaps most importantly, financial and economic circumstances have diverged significantly across the provinces, making it more difficult to meaningfully compare levels of public spending. Therefore, it may be best to consider government expenditures as a percentage of gross domestic product (GDP), which is a technique generally used to compare public sector spending between nations with very different economies. Chart 3 shows just how low Alberta is on this metric. In terms of public spending relative to the size of the economy, Alberta is easily the lowest in the country, with government expenditures of just 13% of provincial GDP. The next closest province, Saskatchewan, has government spending of 17% of its GDP, and the national average by this measure is 22%. Based on this provincial comparison, the fiscal problem in Alberta is clearly not an expenditure problem, as Premier Prentice and others have claimed. It is a revenue problem. “Canadian Club of Calgary Address.” Canadian Club of Calgary Address. Government of Alberta, 26 Feb. 2015. Web. 10 Mar. 2015. CBC News. “#PrenticeBlamesAlbertans Outrage Fuels Hand-mirror Rally at Legislature.” CBCnews. CBC/Radio Canada, 08 Mar. 2015. Web. 10 Mar. 2015. Greg Flanagan is a public finance economist with an MES (Political Economy and the Environment) from York University, and MA (Economics) from the University of British Columbia. Greg has taught and been in administration for 30 years in the Alberta post-secondary system, and recently retired from the University of Lethbridge. He has been involved with Parkland Institute since its inception as a board member, frequent researcher, and advocate; and is a distinguished research fellow.